Alert: Hawaii’s Kilauea Volcano Has Likely Now Destroyed 600 Houses In the Lower East Rift Zone, lava fountaining continues at fissure 8, with fountain heights of 130 – 210 feet. It continues to feed a lava flow channel through the Kapoho area with an ocean entry in the Vacationlands subdivision area. It is still producing a vigorous steam and laze plume that, depending on wind direction, has been blown to the southwest. We remind you that laze, or lava haze, is a localized hazard and will not travel far downwind. The northern lobe of the fissure 8 flow has stalled, although there is some incandescence in the finger of that lobe that advanced into a low graben (or depression) several nights ago. No other fissures are active at this time. Pele’s hair and other lightweight volcanic glass fragments are accumulating in the Leilani Estates subdivision, and strong winds may blow those particles farther from the area. Because these are glass particles and could cause skin and eye irritation, you should minimize contact with them. At the summit, a small explosion, with energy equivalent to a M5.6 earthquake, occurred at 4:07 PM yesterday and created an ash plume that rose to a height of 10,000 feet. Seismicity dropped after the explosion, but can be expected to increase again until the next explosion. Slumping of the rim and walls of Halema’uma’u Crater continues in response to the ongoing summit subsidence. Vog emissions from the summit and fissures remain high and in the next several days wind may bring vog not only the south and west sides of the island, but to the interior as well. 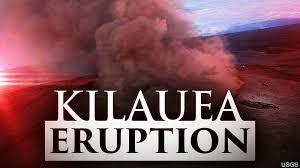 This entry was posted in Uncategorized and tagged June 6, Kilaeau eruption, Kopoho bay filled in, love, Vacationland destroyed. Bookmark the permalink.